On Sunday, the first episode of PIECES was released on YouTube. PIECES is an online series that's a classic sci-fi mindbender in the tradition of Inception or The Matrix. When a man named Jacob Clarke is diagnosed with a brain tumor, he starts hearing a voice that seems almost omniscient. When Jacob starts following the Voice's instructions, he finds himself an unwitting hero. Then the Voice tells him to do something else: kill a man. Clarke's decision whether to follow or ignore the Voice sends his life in a terrifying new direction, and he is forced to question whether he's gone insane or is experiencing something supernatural. Of course, the show can't be judged by the standards of a conventional show. It's a labor of love. There are no big-budget special effects or big name actors or writing staff. The entire production is written, directed, produced, and mostly performed by one man: Dylann Bobei. I was impressed by how many information was conveyed in such a short amount of time. There were obvious shortcuts made due to a limited budget and sets. 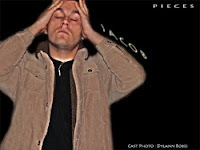 For example, Jacob is taken to a hospital, but we never see it. There's just an overhead shot of Jacob's face with hospital sounds, then a fade to Jacob back at home, lying in bed while his mother pleads on his answering machine to talk to her about his cancer diagnosis. Obvious cheat, but I was surprised how well it worked. Actually seeing the hospital wasn't necessary, and it actually seemed more expedient and moving than actually showing the scene of the diagnosis. Much like the malfunctioning shark robot in Jaws forced Spielberg to leave the shark invisible most of the movie, finding other ways to convey the story made it more interesting. The acting is pretty good, although most of it involved Jacob acting confused. Occasionally he came off a little stiff, but I still managed to believe and care about the character. I look forward to getting past this initial phase so we can see more range in Bobei's acting. Overall, I thought the first episode was a great start to what could be a very entertaining show. I hope that Bobei can sustain and follow through on the mysteries introduced here, and can also expand the scope and depth of the concept. I'm looking forward to seeing it. Good to know we have other sources to turn to for sci-fi than movies and TV. And it's free.